Photo of the Week: Can a Lily? Can lilies brighten up a shady lane? 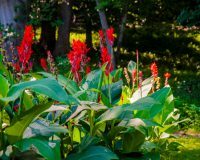 These canna lilies on Heyburn Road can.